Forget phones, tablets and ‘phablets’ – the next big thing could be ‘smartlets’, phones which unfold into tablets. Samsung is planning a wave of bendy-screened gadgets – and it could be a ‘game changer’ according to analysts. The Korean phone giant, which already sells phones with curved screens, is said to be planning devices already, according to Bloomberg. One device is a 5-inch handset which ‘unfolds’ into a larger 8-inch tablet, according to company sources. Another folds in half like a compact mirror – and the devices could go on sale early next year, according to sources. ‘This product could be a game-changer if Samsung successfully comes up with a user interface suitable for bendable screens,’ said Lee Seung Woo, an analyst at IBK Securities Company. 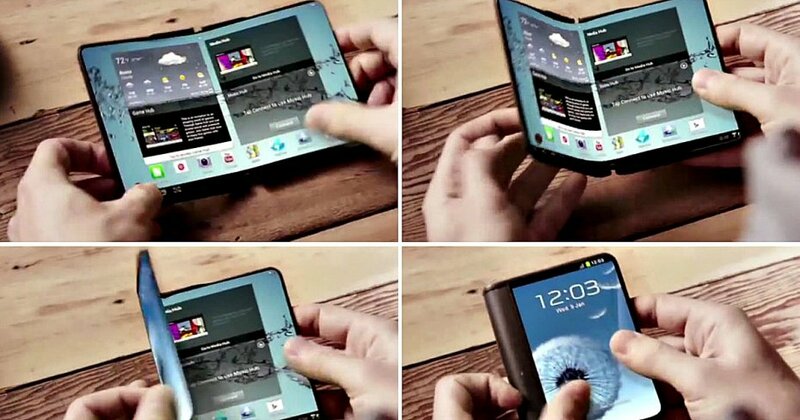 Samsung has previously teased the idea with various videos showing how a ‘bendable’ smartphone might work.